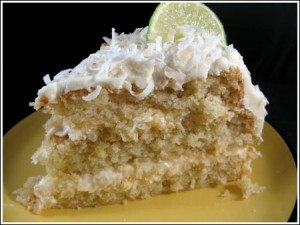 A three layer Key lime layer cake with a lime flavored cream cheese frosting. Preheat oven to 350 degrees F. Spray 3 9-inch round baking pans with flour-added cooking spray. Sift flour, sugar, baking powder, baking soda and salt together into mixing bowl. Add eggs, oil and lime juice mix on medium speed of an electric mixer until creamy. Add sour cream and zest; mix until smooth. Pour cake batter evenly into cake pans and bake for 25 to 35 minutes or until a tooth pick comes out clean (mine took 32 minutes). Cool in pans for 5 minutes and then turn cakes out onto cooling racks. Cool for 1 hour. Spread frosting over cakes, stack and ice the whole cake with frosting. Spread toasted coconut over top and down sides. In a mixing bowl, beat together cream cheese and butter. Add vanilla, then add 2 cups of powdered sugar. Beat in the lime juice – beating and scraping sides of bowl all the while, then add remaining powdered sugar 1/2 cup at a time until you reach desired consistency and sweetness. Adjust with more lime juice if desired. Toasted Coconut: Spread on baking sheet and bake in a pre-heated 375 for about 5-10 minutes. Stir often. Let cool. I like to cook mine until some of the coconut is lightly browned.